Rava kichadi is one of the healthy delicious south Indian breakfast recipe. Its very popular because of its melt-in-mouth taste and divine spicy aroma. I just love the fantastic combo of delicious rava kichadi along with coconut chutney and I can eat it for any meal of the day. Its a quite popular recipe in South Indian weddings too. Its prepared with rava, (sooji or semolina), vegetables, ghee and aromatic spices. 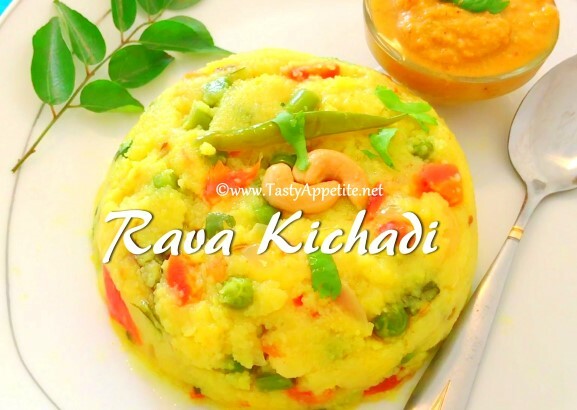 Check out this yummy recipe & enjoy flavorful Rava kichadi at your home! Slice vegetable and set it ready. Heat 1 tsp of ghee in frypan. Add rava and roast it in low flame for 5 mins. Heat 2 tbsp of ghee and 2 tbsp of oil in fry pan. Add bay leaf, cinnamon, cloves, cardamom, cumin and saunf. Add grated ginger, sliced green chilli, curry leaves and toss. Add diced carrots, beans, peas and saute in high flame for a minute. Add 1/2 cup of hot water and stir. Cook the vegetables by covering with a lid in high flame for 2 mins. Now add the roasted rava and combine well. Add 2 & 1/2 cups of hot water and mix. Once its done, turn off flame. Garnish with roasted cashewnuts and freshly chopped coriander leaves. Lipsmacking delicious rava kichadi is ready.